Directions: Trail head and staging area are on Highland Valley Rd., just east of Archie Moore Rd. From I-8 go north on Hwy. 67 toward Ramona. Turn left (north) on Archie Moore Road Go east on Highland Valley Road. Length of Trail: 4 miles of multi-use trails. More trails are in the works. Trail Conditions: Trail is open 7 days a week year-round between 8 am to 5 pm in fall and winter and 8 am top 7 pm during the summer months. The trail is open to hikers, bikers and equestrians. Dogs are welcome, too. 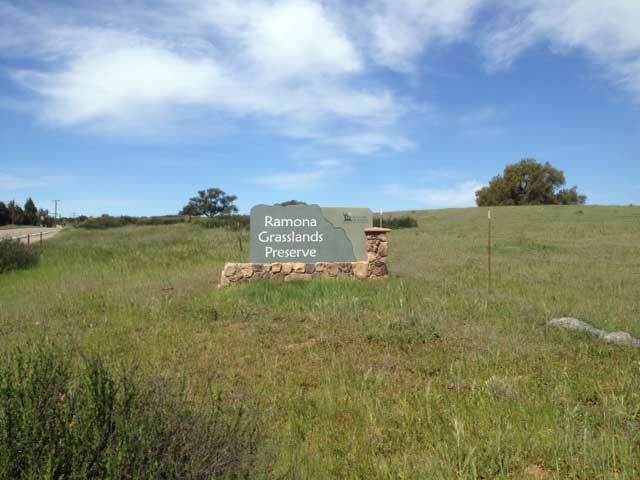 The Ramona Grasslands Preserve is located in the Santa Maria Valley, situated between the coastal mesas and the mountains of the Peninsular Ranges in west-central San Diego County. About two-thirds of what was once an extensive grassland ecosystem in the Valley has been lost to development. The Santa Maria Valley’s remaining grasslands are largely intact, though fragmented by roads and subjected to edge effects by adjacent residential and infrastructure development. The preserve is 3,521 acres. Currently, a 480-acre western portion has a four-mile loop trail that allows public access. 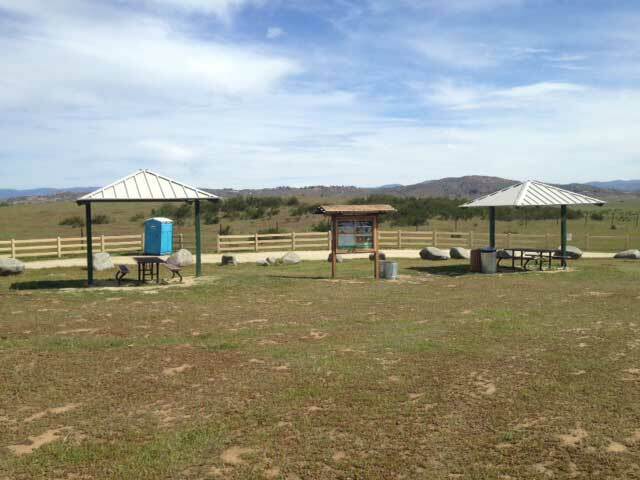 Mountain bikers, hiker and horseback riders are welcome. The rest of the preserve is not yet open to the public, but additional trails are planned. 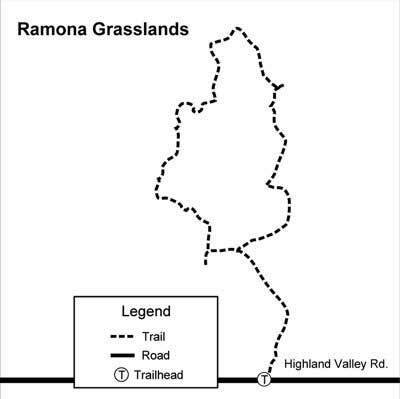 The Ramona Grasslands Preserve includes a significant portion of the remaining undeveloped portion of the Santa Maria Creek watershed. 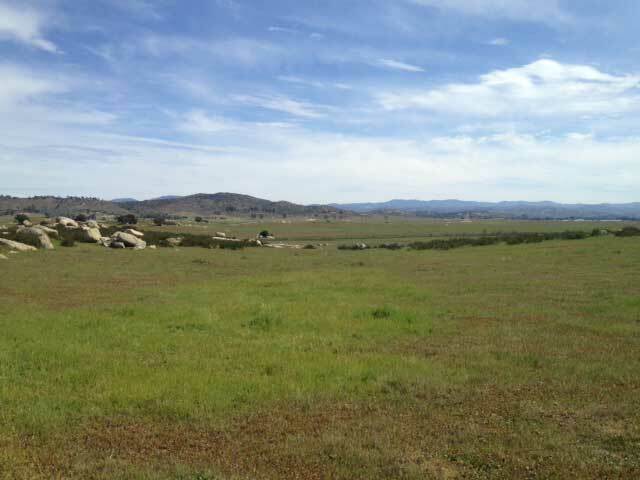 The watershed supports a mosaic of habitat types, including native and non-native grasslands, coastal sage scrub, chaparral, oak woodlands, Santa Maria Creek, its adjacent riparian area, and a diversity of unique vernal pools, vernal swales, and alkali playas. Many rare animals make their homes in this area. Stephens' kangaroo rat, fairy shrimp, purple stipa, blue-eyed grass, and wooley blue curls are among the rare inhabitants. Bird watchers are drawn to the grasslands for the spectacular number of hawks that spend the winter here. Santa Maria Creek, which runs through the grasslands, adds to the bio-diversity.